OK, I have explained my thoughts on Christmas and Birthday presents, so no need to be any specific date, but I though I would mention one thing I would like. It was 110 Baud current loop and I could type at just the right speed to jam it up. It had a real carriage return and line feed, and even bell! I'd set up a Pi to connect it to irc or some such and set up in our meeting room. I'd need paper rolls, print ribbon and paper tape, obviously. The picture looks right, just I do not recall the four clear button things. That may be my memory as every googled image I can find has them. It definitely had a paper tape punch and reader, so must have had controls of when to punch and when to read, and so on. We even managed to send paper tape that printed large lettering sideways on the tape as banners. They are getting rare. So if ever someone feels like finding something I have not got and not been able to find - that is it... They must have made thousands, and I bet almost every one was scrapped. What you're looking at is an ASR-33 teletype, in case anyone wants the model name. I had one back in the 1980s, hooked it up to my BBC Micro and a little Z80-based thing I made. I still have both of those, but the teletype is long gone. I have recollection that I had to insert a couple of null characters after the carriage return in order that it got back to the start of the next line before it started on the next one, otherwise the first character of the line would be found part-way across the page. I don't recall if it was after CR or NL, to be honest. But CR sounds right - it took a while on a long line. Both have to be sent, and it makes sense to send the CR first because the linefeed can be done while the print head is moving back and reduces the number of null characters required. I found it easier to just add NUL characters than to wait a bit after a CR, which was the other option. They are loud, especially when it's on an upstairs floor and the TV is in the room underneath. You could approximate one by putting an old dot matrix printer on your desktop, redirecting stdout to it and hiding the monitor. Oh wow - nostalgia+. 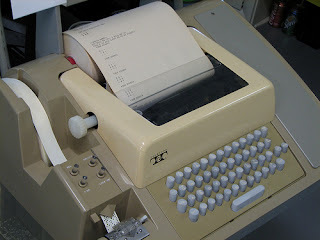 They were the step up from punched card editing (but you still needed to use them to get the code+data in to the ICL). can't remember the editor but it was ex: like so you had to remember where you were (which line) but you could list and 'save' to the tape. Tape was also used to input data when it was output on an x-ray detector. Some had a very expansive typing style as you had plenty of time to lift the arm up in the air and back down again (to avoid jams) and a lot of people used the password 'FRED' as the keys were next to each other and you could feel when you could push down. Damn noisy in the room - MOP - Multiple Online Processing. (Also used for comms of course - TELEX - used to be the main way to contact other offices out of hours). How about a Tektronics VDU unit where you could draw graphs and 'print' on to silverised paper. I remember the smell but awful output. That picture brings a tear to an old man's eyes and prompts recollections of life with a Teletype in the 1970s. In particular when it was the only I/O device attached to a PDP11. Programming was in assembler but the assembler software had to be loaded into the machine using the Teletype's tape reader at 10Bps. (High speed tape readers cost an arm and a leg, so it was Teletype or nothing.) The assembler took, as I recollect, about 15 mins to load, provided that the reader did not misread, which it did only too often, especially if the tape got caught and the sprocket pulling the tape through the head started to tear the sprocket holes. Then the program tape had to be loaded in the same way. It was a wonder that any work got done. Then think of all those essential skills that have now been forgotten, such as how to splice paper tape, how to run out a few inches of tape every foot or so to leave blank tape to make splices. And what happened to all the Teletype technicians who knew just how to sort out all the springs and bits of metal under the covers? However, the Teletype was in its day a brand new wonder compared with what went before. It had 8 channels so that a massive 255 characters were available, compared with the Creed teleprinters that I started my computing life on in 1963 with their mere 5 channels, which necessitated the insertion of letter shift or figure shift carriers. Cambridge University had a high speed optical paper tape reader they built themselves. The problem with that was when it went wrong and the take up spool failed it could spew paper at many metres per second all over the floor. I never saw the tape machine in use, it sat there looking weird when I started my degree in 1984, but old hands recalled having to clear mountains of tape from the floor and rescue the odd buried undergraduate. RevK. Try contacting one of the telecoms museums or preserved railways. Several of them eg Dean forest railway use ex BT strowger exchanges to run their telephone systems and just might have one squirreled away or know someone who has. Another suggestion is through your BT contacts find out who the local exchange manager is and ask if any of the old crossbar or txe2 exchanges might have not been fully cleared and scrapped as i think they may have used them. Latest nonsense from ASA in collusion with OFCOM! How many grammes long is your parcel?